Whether you’re new to TIG Welding, or a master fabricator, the myriad adapters, connectors and couplers on the market can be overwhelming. To complicate matters further, over the years manufacturers changed the design of their welding machines, taking advantage of inverter technology and streamlining the options. There are many different styles of machines in the field today; these tips will make hooking up your TIG/GTAW torch to any machine easy. 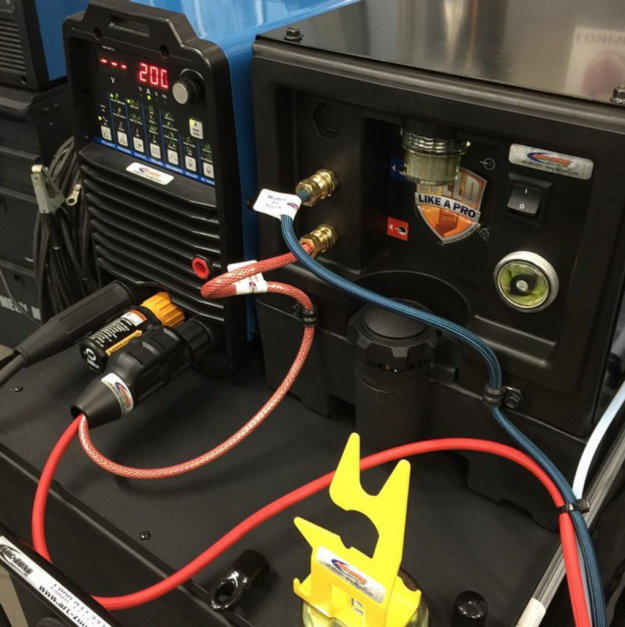 To properly hook up your TIG torch to your welding machine, the first thing you need to know is what kind of connection your machine supports. With older power supplies the TIG torch bolts onto the machine via a threaded stud terminal on the front panel of the power supply. Newer welding machines make use of an international style Dinse connector which is a twist-locking quick disconnect system. There are two sizes of Dinse connectors: small, which the pin size is 3/8″ (9.5mm) in diameter, or the more common large Dinse connector with a pin size of 1/2″ (12.7mm) in diameter. Some machines allow for a Gas Through Dinse connection, whereby your torch’s shield gas supply flows through the Dinse connector, eliminating the need for an additional gas connection. The gas flows from your tank and flowmeter/regulator through the machine to the connector and into the torch. Some power supplies use a Tweco type (also called American style) split pin connector that also twists and locks into place. 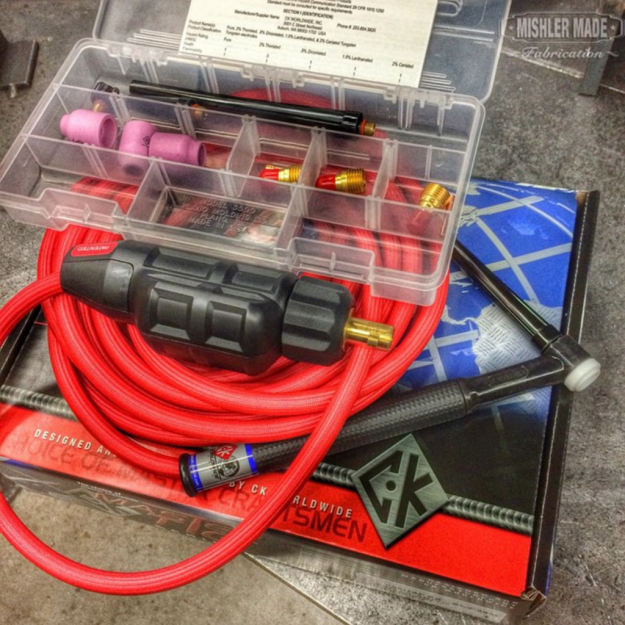 Different TIG torches have different TIG torch adapter connections at the machine end. A water cooled TIG torch has a 7/8” x 14 left-hand threaded male fitting on the end of the power/water return line. Generally an air-cooled TIG torch rated 200 amps or above has a 7/8” x 14 right-hand threaded male fitting and an air-cooled torch rated 150 amps or below has a 3/8” x 24 right-hand threaded male fitting on the end. Here’s a How-To guide to connecting your water-cooled TIG Torch. Some specialty torches like the CK TrimLine series use a “B” size 5/8” x 18 right-hand thread. 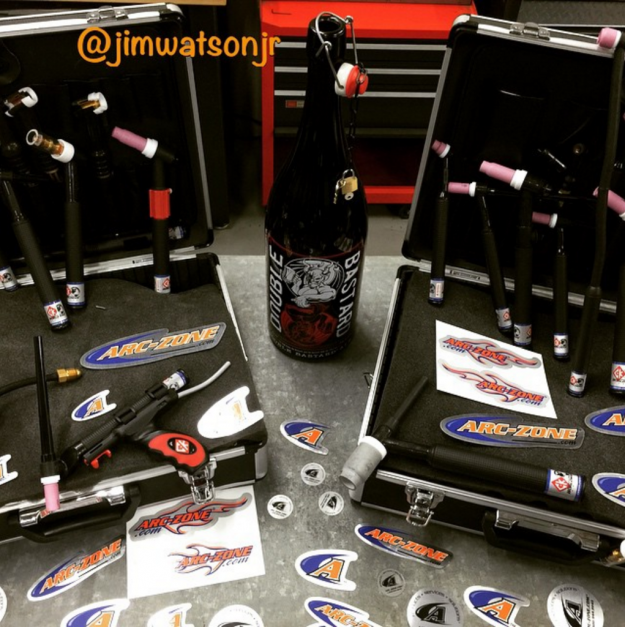 While these fittings may look like parts you can buy at your local hardware store, they are unique to the welding industry and available through welding suppliers only. Upgrade your machine(s) to accept a Dinse style connector to make switching from one torch to another easy. For a large corporation, this means you can standardize your connections and run different applications at different times, or accommodate different shifts, removing and storing torches to protect them from theft or damage. Even a small fabrication shop will want to be able to use different torches on the same welding machine. With the Dinse connectors you don’t need tools to change your torch, and all your torches will connect the same way. Also, the connection is insulated with a rubber or plastic boot. Heavy-duty gas hose couplers are also available for just a couple dollars more and are a better choice for welding in the field. Also see the Quick-Release Water Hose Plug and the Quick-Release Gas Hose Plug. Note: These Quick-Release Plugs are used on many newer welding machines, including Everlast & Longevity welding machines.